The squawks of ‘alala reverberate through the forest in Olinda. Also known as the Hawaiian crow, this relative of the raven is extinct in the wild. Its cries originate from a cluster of aviaries at the Maui Bird Conservation Center, which is surrounded by a pine forest near the top of Olinda Road. “They have 34 vocalizations,” said Natalie Staples. She is a research associate at the center and was a leader of one of the tours offered during an open house last weekend. Originally a minimum-security prison, the six-acre complex was transformed in the late ’80s into a place of refuge for endangered endemic birds. There are currently four species living in aviaries at the back of the property. To the casual observer, the main building looks more like a school campus, that is until one journeys down the stairs to the basement and sees three solitary confinement cells. The doors have been removed from the cells and the area is used as an emergency bunker. At ground level, the majority of the rooms are used for the care and propagation of the feathered residents. Artificial incubation of eggs is a big part of the operation. Special equipment is used to check if eggs are fertile, keep them at the correct temperature and ensure a successful hatch and bird growth. Some of the species, for example, will identify with (imprint) the first individual that feeds them – so special enclosures with one-way mirrors are employed, along with puppets that resemble the bird’s parents. If a newborn bird thinks it is a human, for instance, it may not breed. Other rooms are used for examining and treating the birds, monitoring them via closed-circuit cameras and preparing their meals. To challenge the birds’ natural inquisitiveness, the staff creates games for them. Staples, who is assigned to work with the ‘alala, showed a box with shredded paper that is used to hide a prize. “The ‘alala are very intelligent,” she said. A picture affixed to the door to the artificial incubation room has a picture of the poouli, an endemic bird that became extinct in 2004. Staples said that the image is there to remind staffers and volunteers of the importance of the conservation center’s mission. While the poouli’s fate is tragic, there is better news in regard to the nene, or Hawaiian goose. From a population low of 30 individuals in 1952, the nene has rebounded to “vulnerable” status with a population of 2,500 individuals. A screened outdoor area at the complex once housed endangered nene but they have all been released. In addition to viewing the squawking ‘alala in their large aviaries, visitors at the center had the opportunity to enter the Forest Bird Barn and get a first-hand look at the kiwikiu (Maui parrotbill), puaiohi (small Kauai thrush) and palila (finch-billed honeycreeper). Staples said that the Maui parrotbill population now numbers 500 individuals and, since 1987, 24 have hatched at the center. Newborn parrotbills will stay with their parents for 18 months, she said. The pauiohi numbered 300 individuals in 2000 and in 2014 there is evidence of 500 individuals in the wild, said Staples. She said released birds are tracked in the wild with bands and tags and with transmitters when first released. The transmitters are designed to eventually become detached from the bird. The palila number 1,500 on the upper slopes of Mauna Kea. Six chicks have been born in two years during a first-time breeding effort at the center. 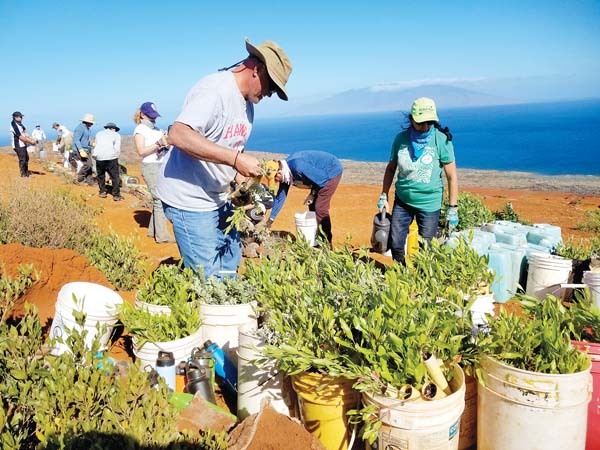 “We’re excited to invite the public to the facility,” said Bryce Masuda, conservation program manager for the Hawaii Endangered Bird Conservation Program. He said that the conservation center on Maui, and another on the Big Island, are operated by the San Diego Zoo Institute for Conservation Research. Funding is primarily through private donations and some grants. Masuda said the open house is a way to bring awareness to the community of the important work being done at the center. People interested in touring the facility may want to mark their calendars for early November 2015. That’s the only time the facility opens its doors to the general public for guided tours.